Article and chapter access: The ability to search BHL by article or chapter titles has been implemented. To date, over 81,000 articles and chapters have been indexed and are searchable within BHL. Additional articles and chapters will become available as the collections continue to be indexed. Open data enhancements: BHL’s APIs, OpenURL interface and Data Exports have been modified to include available article and chapter information. Book viewer updates: Users will now be able to view multiple columns of pages on screen at once and more easily navigate to a specific page within a book. Users can also view optical character recognition (OCR) text alongside page images, and, where the books have been indexed, can navigate directly to the articles or chapters within using a new table of contents feature. PDF creation improvements: The custom PDF creation process has been improved, allowing users to select pages for their PDF while in the book-viewer mode and more easily review the PDF before creation. In addition to these changes, BHL will soon implement a new algorithm capable of identifying previously undiscovered taxon names throughout the BHL corpus. Test applications of this algorithm on a portion of the BHL corpus have already resulted in an increase of nearly 50 million names instances in BHL. These developments follow BHL’s December 2012 milestone achievement of providing access to over 40 million pages and over 110,000 volumes of freely-available biodiversity literature. 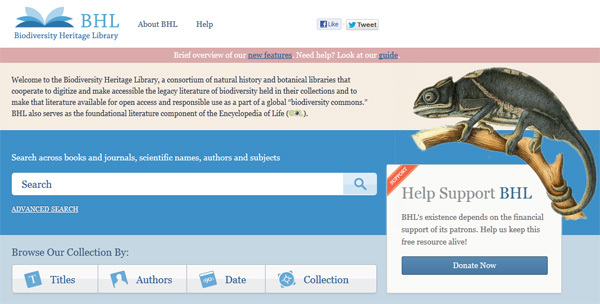 BHL partners comprise 15 natural history libraries in the U.S. and the United Kingdom. They are committed to working together to digitize the published literature of biodiversity held in their respective collections and making that literature available for open access and responsible use as a part of a global “biodiversity commons.” The BHL Secretariat is hosted by Smithsonian Libraries. The Technical Director and portal development team are hosted by Missouri Botanical Garden. Affiliated BHL projects have been established in Europe, China, Australia, and Brazil. To further explore the new BHL, visit http://www.biodiversitylibrary.org/. Previous Post Joyeux Anniversaire, Felix Nadar!